Heat oven to 350°F and line the bottom and sides of a 9-inch square baking pan with parchment, leaving an overhang on all sides to easily lift the brownies out of the pan. Set aside. In the bowl of a stand mixer fitted with the paddle attachment, combine Brownie Mix, spices, orange zest, eggs, melted butter, and water. Beat on medium speed until just combined. Scrape down the sides of the bowl as needed. Spread batter evenly in prepared pan. Bake for about 32-35 minutes or until a toothpick inserted 2 inches from side of pan comes out almost clean. 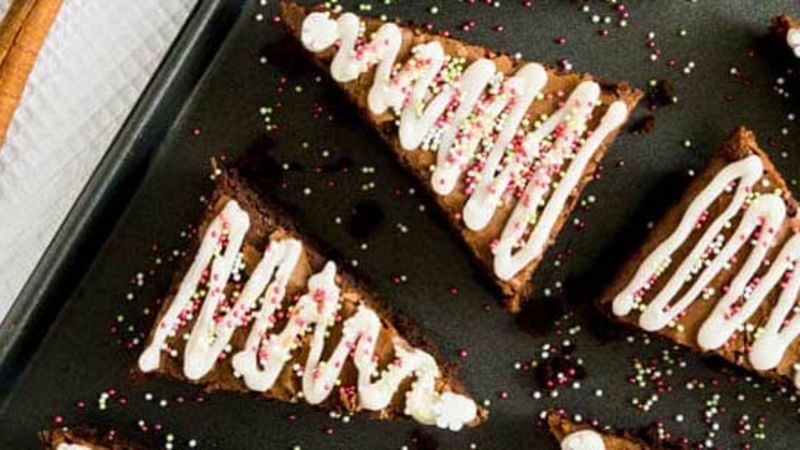 Allow the brownies to cool completely in the pan set on a wire rack. Once cool, lift them out of the pan using the overhang on the sides and cut into 10 triangles (trees) like shown in the picture above. Transfer the Christmas trees to a parchment lined baking sheet. In a small bowl, combine Confectioners' sugar and 2 tsp water or rum. Add a little bit more water if needed. The glaze should be thick. Store in an airtight container at room temperature or in the refrigerator for 3-4 days.